I wasn’t quite sure what exactly I was going for as I shot the pictures but I knew I wanted it to be dynamic. Even though the tree stump was a fixed element and the man himself wasn’t really moving around too much, the chainsaw carving away gave the scene an incredible sense of life and vibrance–something I was hoping to capture with my camera even though I wasn’t quite sure how. I got about 25 images and looking through them it finally clicked: wood chips. That was the secret sauce that added the sense of life and action to the image which I wasn’t even thinking about at the time I took the photos. I mean, I was fairly pleased with how some of the other shots turned out but most of them didn’t explicitly show tree shavings flying around and you couldn’t really see the bar of the chainsaw either, and both elements were clearly present in this picture which I really liked. I shot this at f/1.8 even though I knew it wouldn’t be the sharpest picture in the world, but given that I was standing several feet away I knew anything smaller than f/1.8 would give me a depth of field that was simply too wide and I was really hoping to get some separation between my subjects and the background. At one point I even tried shooting through the leaves of a small tree to get a bit of foreground in the mix as well, but it ended up just being distracting and kind of gratuitous. Despite the fact that almost none of this was planned out beforehand I am quite happy with how the shot turned out, and it’s cool to have something like this wood carving here on campus. 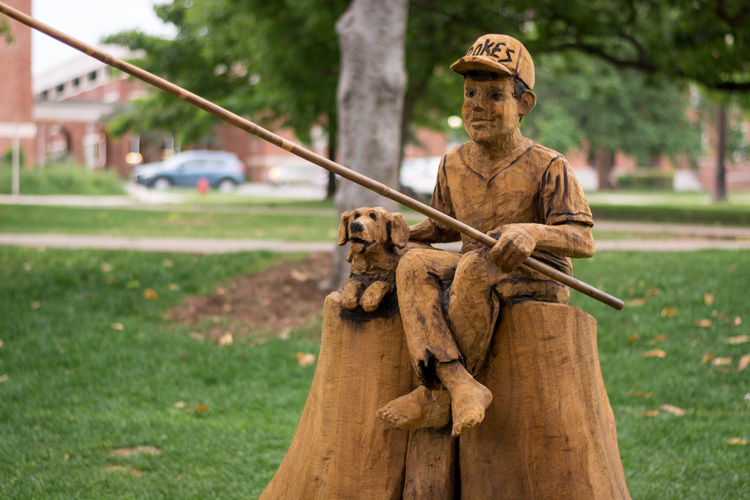 You can’t see it in this picture but the boy and his dog (the thing the carver is working on in the photo) are facing a pond and it really does create a calming pleasant scene when you see it in person. A few hours later as I was leaving campus to head home I caught up with the carver as he was walking across the lawn and we had a brief but incredibly heartwarming chat. His name is Clayton Coss and for nearly the past three decades he has been giving new life to dead trees by turning them into beautiful works of art. You can watch his story in this video, and I hope you enjoy it as much as I did. The next morning I saw the finished tree carving, and it really was a sight to see. Mr. Coss, if you ever read this…thank you for such a marvelous addition to our campus here at OSU. *There’s much more to the crop vs. full-frame issue than this, and shooting a 50mm on crop does not magically make it a 75mm lens in terms of composition, background compression, etc. but it does give you a similar field of view as a 75mm lens which is all I meant here. Nicely captured. I like the shadows on the boys face on the top shot. What an amazingly talented man Mr Coss is! What a nice way to greet the day! The photo showing the wood chips flying IS dramatic. Well done! I enjoyed your talk about how you approached composition in the picture. That resonated with me as to the proper steps to take when capturing an image. It ain’t just pulling out your Kodak and snapping away! You taught a good lesson today. Thank you. p.s. Will have to have my girls go by and check the wood sculpture! Thank you David! I’m glad you like the picture and while I do think it’s possible to get some nice pictures if you just pull out a pocket camera and snap away, I tend to prefer a slow-and-studious approach. Though there is definitely a time and a place for quick snapshots too! Very cool, Simon. That kid looks like a chip off the old block! I like the idea of always looking around you to find interesting photo opportunities. 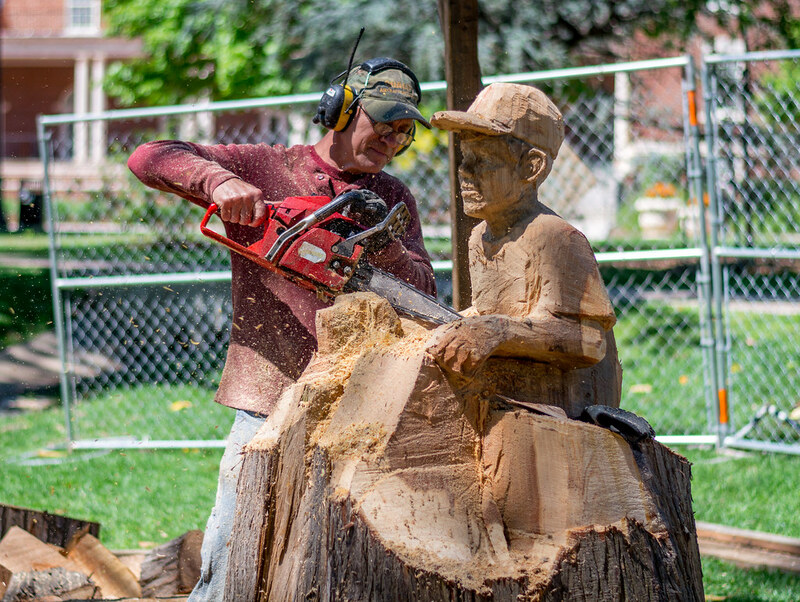 It is interesting how you were able to catch the artist at work and show him actually working with the movement of the wood chips and not just posing for a photograph. I listened to your interview on TWIP and thought I would let you know why I read your blog, since you said something about not knowing why anyone did. I like the explanation of the process, how you saw the opportunity, how you photographed it, what you liked about it and what you didn’t like about it in comparison to what you were imagining. You are honest about your experience sharing both your successes and failures and you don’t pretend to be telling everyone that you have all the answers and get a perfect image every time you try. You are very down-to-earth with your experiences and are able to find photo opportunities in some very ordinary situations. This is something that I can relate to. I am not interested in becoming a professional photographer, but I greatly enjoy the experience of learning about photography and creating images and your blog helps me see possibilities and reassures me that it is all right to struggle through the process. Thanks for sharing your experiences, it benefits more than just yourself. Great post and I like how you focused on the flying wood chips to give the shot more impact. Thank you so much Debbie! I’m glad you thought the flying wood chips helped make for a more interesting photo! Yup, the wood chips bring it to life for sure! Glad you included the final product – I rather like the Norman Rockwellish look of it.